Egg cartons aren’t something I used to think about a lot. Yeah, I know how silly and strange that sentence sounds hanging in the air. But after you see some of the absolutely amazing crafts that people make out of them, you’ll suddenly be thinking about them a lot too. I mean, how many egg cartons do I go through over the course of a year? I’m going to start stockpiling! It’s hard to come by a free craft supply that’s as versatile as this one. There are a lot of awesome projects you can do with your kids that involve egg cartons, but also some stunning beautiful artistic projects you can do yourself to spruce up your home. 33. Create a working glider out of a Styrofoam egg carton. Wow, it is hard to find a more elegant project for egg cartons! 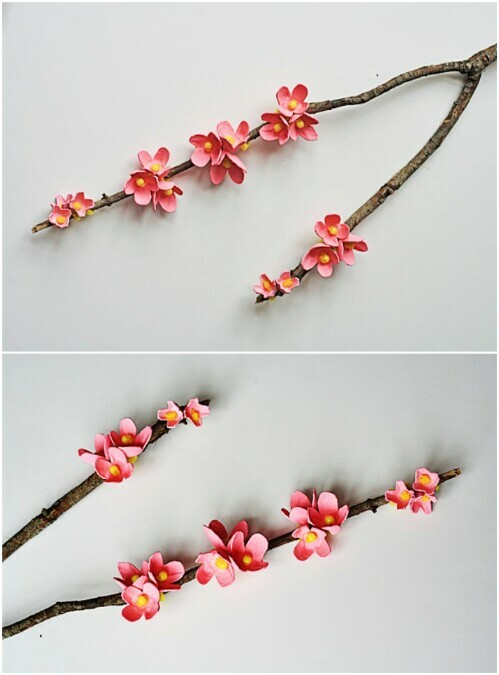 These cherry blossoms are easy to make with yellow pony beads and pipe cleaners. You just need a branch and a hot glue gun. You can find the full instructions and supplies list on the source site below. Just think how beautiful these would look accenting your walls. If you liked the project above but want to take it a step further, here is another project which is similar. 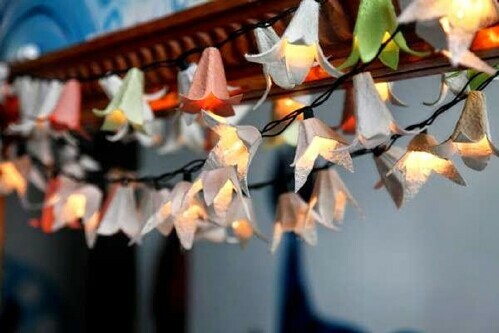 Once again you can make flowers out of egg cartons, but instead of simply hanging them from the ceiling vertically, you can run a string of lights through them and then hang them horizontally along a wall. This gives you a way to create some great mood lighting. If I hadn’t known these were originally egg cartons, I never would have guessed! 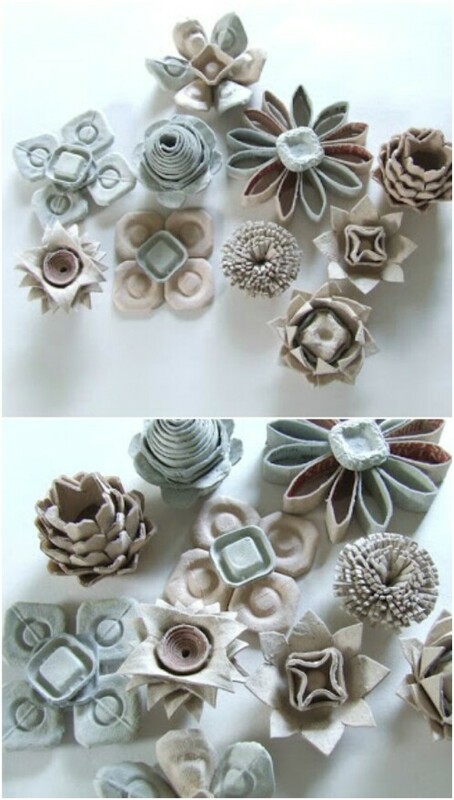 Want to make flowers out of egg cartons, but achieve a very different effect? 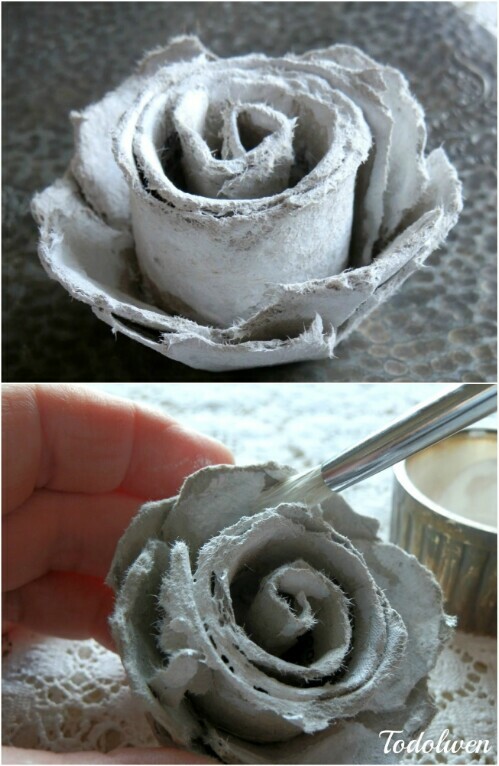 This is a project which will allow you to transfer an egg carton into a mesmerizing rose. I cannot get over how delicate and elegant it looks! There is a roughness to the texture, but to me that just adds to its character. This creative crafter has left step-by-step instructions with images that you can easily follow. It looks like a challenge, but you have everything you need to complete the project yourself at home! Looking for a project that you can do with or for your children? 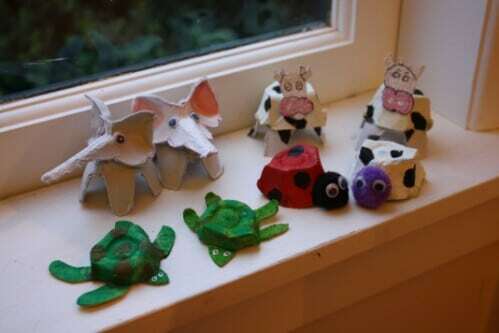 These have to be some of the most adorable little animal friends I have ever seen, and all of them have been crafted out of perfectly ordinary egg cartons! I cannot get over those elephants. They are just so cute! None of these look particularly challenging. Even though there are no instructions, replicating them should be fairly easy at home with a pair of scissors, some paint, and a little patience and love. These are so cute that they will be treasured for years to come. 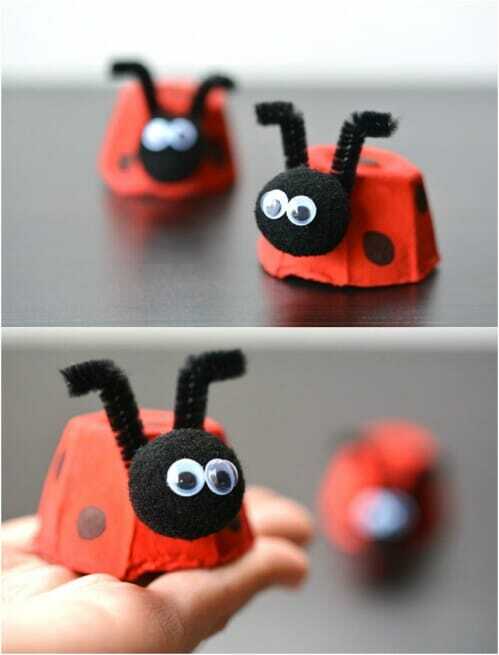 If you are looking for instructions for ladybugs similar to the ones that you see above, I’ve found them for you! This project by Debbie Chapman will teach you how to make adorable little egg carton lady bugs complete with pipe cleaner antennae. The steps are minimal and simple, so even small children should be able to participate in this one. While you are at it, you can probably figure out how to make a lot of other different types of bugs too! 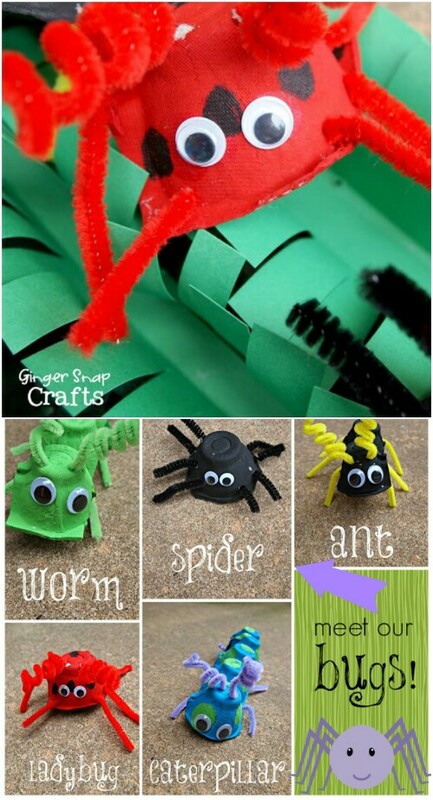 Just use different colors of paint and you can create beetles, bees, and more! I am not even sure what to begin to say about this one. Seriously, isn’t that the most amazing thing you have ever seen?? 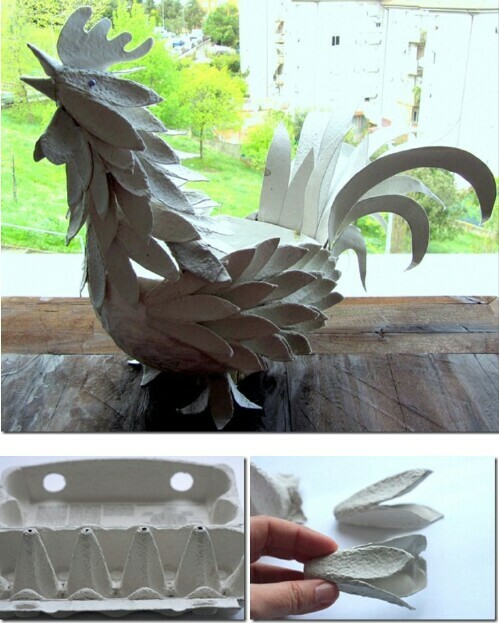 This rooster sculpted out of egg cartons is absolutely gorgeous in every respect. There is a beautiful flow to the design which is incredibly artistic, and I love the way that the “feathers” (which are very convincing) have been painted in a gradient of colors, leading the eye from head to tail. Believe it or not, you can find detailed instructions for this challenging egg carton craft below! If you liked the somewhat rustic but elegant rose project from earlier, this one will just blow your mind. These are some of the most stunningly realistic flowers I could imagine ever being made from an egg carton! Okay, you know what? That sentence sounds ridiculous because it is. Who could ever imagine a result this phenomenal? From the perfect cut and fold of the petals to the realistic paint job, I am just blown away. Best of all, there are step-by-step visual instructions for you to follow! There is something about a frame around a mirror that just makes everything inside it look better. I guess that makes sense. The frame is a way of saying, “The face you see in the mirror is important”—and we could all use that. But if I saw a mirror like this one in person I don’t think I would look in it at all! I would be too mesmerized by the beautiful egg carton blooms sculpted and glued to the edges. This project comes from Better Homes and Gardens. The instructions are not very in-depth, but should give you a pretty good idea of what you need to do to craft something similar at home. Here is another type of flower you can make with egg cartons that is different from any of the others I have featured so far. I don’t know what type of flowers these are, but they are gorgeous! I like that you could paint these any color you wanted. They’d look lovely brightening up any room, and I imagine a bouquet of these would make a wonderful gift! A full tutorial can be found at the link! I’m a grown-up and even I get excited at the thought of making these little egg carton bugs! There is a worm, a spider, an ant, a caterpillar, and a ladybug, and I can’t decide for the life of me which one is the cutest. I want to make them all! 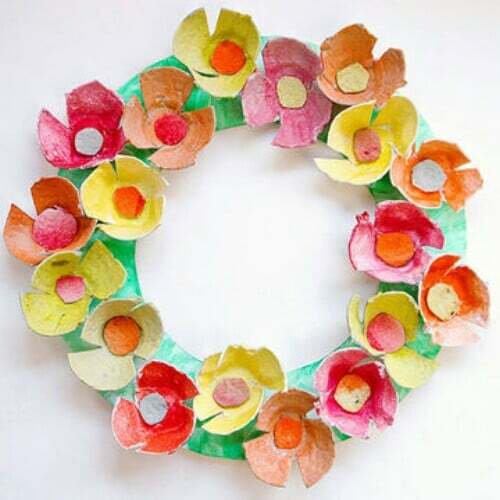 We’ve seen how you can make a number of different types of flowers using old egg cartons now, but most of those projects would be challenging at any age—probably right out if you are looking for something to do with younger children. 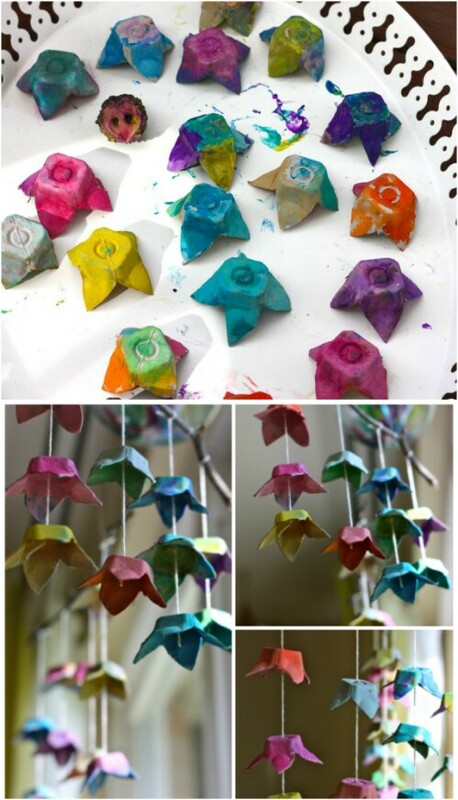 One project for making flowers with egg cartons that you could do with your kids is this one! These flowers do not look as realistic and sophisticated as some of the others featured in this list, but they don’t have to. They are utterly delightful, and the step-by-step instructions are simple and easy-to-follow. Do this fun project with your kids, and if they enjoy it, you can work your way up to a more challenging one later! 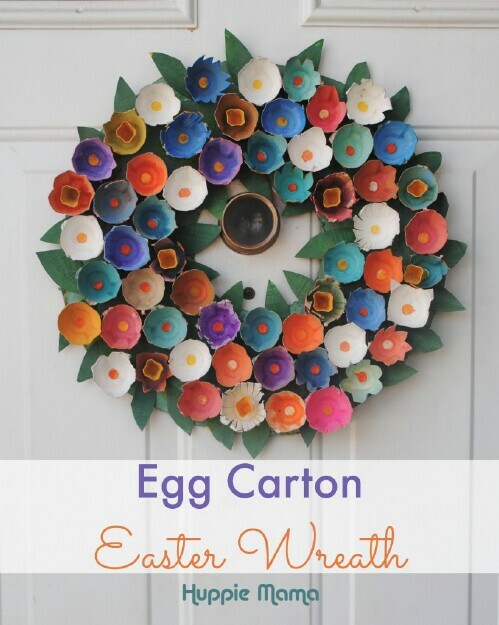 Wreaths and frames are popular projects for up-cycling old egg cartons. Usually they feature flowers, but generally they take a lot of work and incredible attention to detail. For children who do not have the patience, they may be too much. If your kids do want to try a wreath project, this one is easy and fast and doesn’t require a lot of elaborate detail! The flowers are simple and won’t be too time-consuming. The finished result is beautiful, as you can see, especially if you paint the flowers in bright colors. Don’t they look spectacular? While these are some fairly short strings, I imagine you could achieve an incredible effect if you went all-out and did a whole bunch of really long strings—or maybe a line of strings starting short near the ceiling and dramatically swooping down to longer and longer strings. There are so many ways that you can make adorable little critters out of egg cartons, but this has to be one of the cutest ideas I have seen yet! I love how this little guy is made out of two pieces hinged together so that he can open his mouth and stick out his tongue. You will need to translate the source site for the instructions, but you could easily reproduce this project without them. It is pretty clear what you’d need to do just from looking at the picture. A fun project for any age, but especially for children! I know … more flowers. 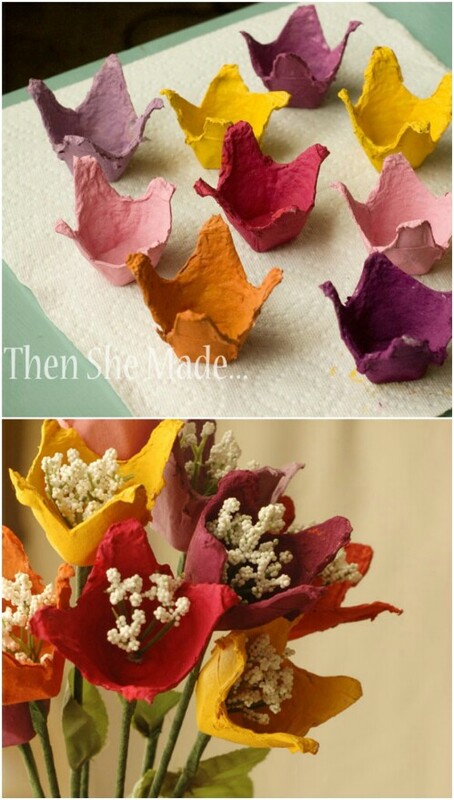 But egg cartons just lend naturally to making flowers, and these are some of the prettiest egg carton projects around. 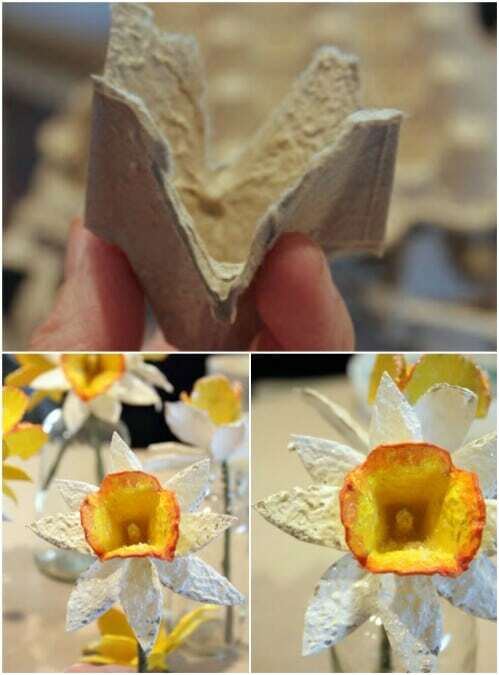 You’ve now learned how to make several types of flowers out of egg cartons, but here is one you haven’t tried yet—daffodils! 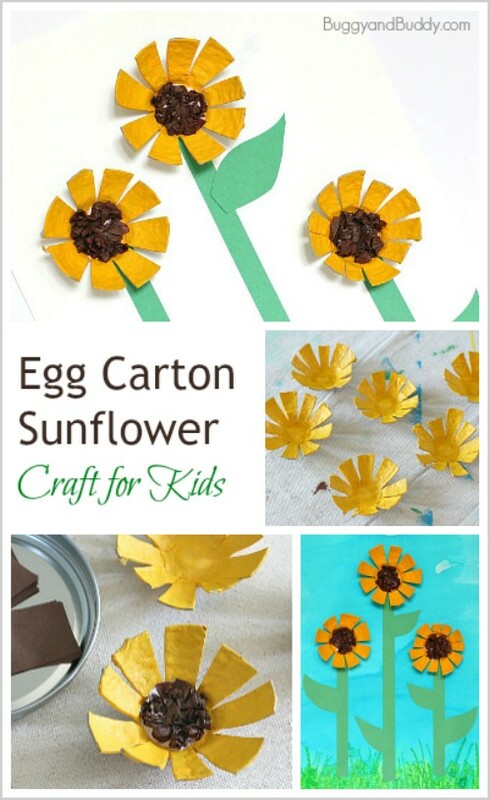 Follow the link and you will find a detailed tutorial that will help you turn ordinary egg cartons into some of the sunniest flowers around. The final touch with these flowers is a bit of Mod Podge. This seals in the paint and adds a beautiful shine for a finished look. Glitter adds some extra texture and looks a little like snow. The flowers’ creator wasn’t a big fan of the glitter look, but personally I love it! This tutorial also provides some great advice for mixing lighter and darker shades of paint to get a realistic look. 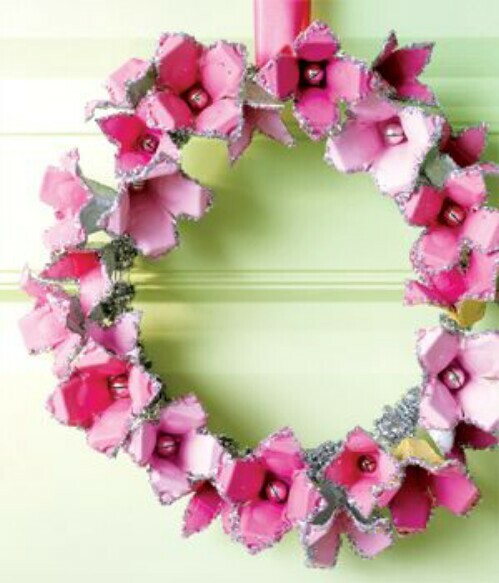 I can’t get enough of these egg carton flower wreaths! Seriously, I swear each one I see is more beautiful than the last. Plus, I don’t know about you, but I always seem to need three or four tutorials to make something so that I can get different perspectives on the instructions. I love combining ideas from each too. 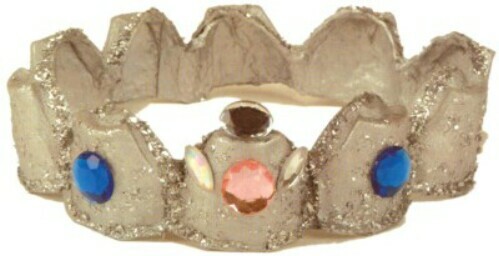 What I really love about this one is the sparkly edges. It really adds some zing without being too flashy. 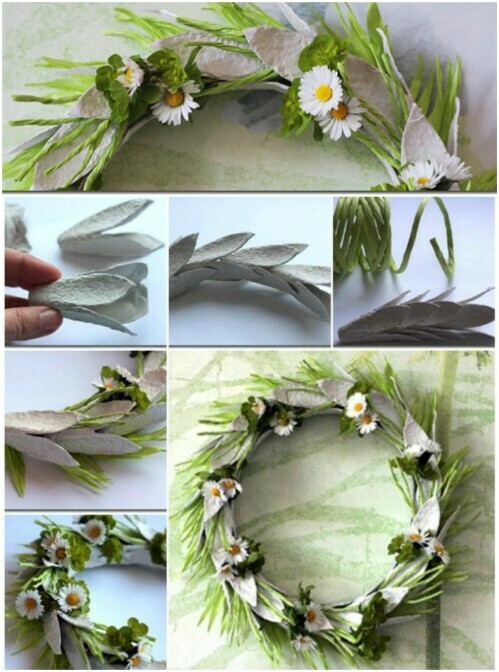 Okay, just one more egg carton flower wreath. This one is really unique; I love how it features so many flowers and has this really full look to it. With the bright colors, it is instantly eye-catching and makes a fun statement! I also have to share this one because the tutorial is awesome. The directions and photos could not be simpler or easier to follow. 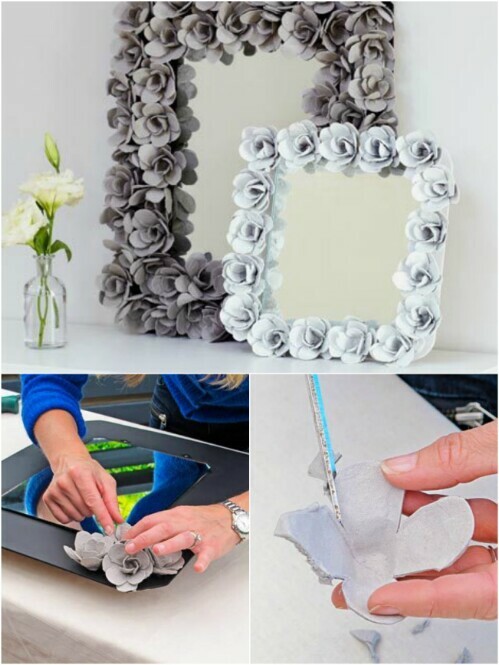 In particular, it is very easy to see how to make the base for the flowers and how you should distribute the glue to attach them all quickly and easily. The finished result is breathtaking! This egg carton flower project gets bonus points for being so clever. When you look at these flowers, you instantly get the feeling that you are looking at something real. This is because the “stamens” inside the blooms are actually made out of baby’s breath! So you get this illusion that you are looking at actual flowers before you realize that the petals are made out of egg cartons. I’m not sure what the leaves are, but I would assume they were taken from fake plants. The baby’s breath is actually fake too—you could go with the fake stuff or real dried baby’s breath and get a great effect! I imagine that you could also combine this idea with some of the others on this list. Another cool idea would be to simply add sprays of baby’s breath to arrangements made using other egg carton flowers. This would again give you that same lovely illusion. This quick tutorial will show you how you can make a simple wall art project out of egg cartons. You will notice as you follow along with the tutorial that this idea is quite versatile. You could feasibly make any shapes you choose, and if you incorporate different colors and use a lot more egg cartons, you could feasibly create “pointillist” type images as well. Another idea would be to paint actual detailed images on the sides of the egg cartons. This would give you an image when seen from a certain angle and a fun artistic comment on the Gestalt principle. Looking at the finished product, you would never guess that this piggy bank was made using an egg carton. There is definitely something humorous in creating a bank made to store very small amounts of money out of materials that will cost you next to nothing. This would be a fun project to do with your kids, and you could easily customize the appearance with different colors. I love that these stools are clearly identifiable as what they are (stacked up egg trays), but they have been painted with bright colors and held together with old luggage straps and rubber tubing. I particularly like the fun geometric shapes in the bright green and pink ones. Where can you get the industrial size egg trays you’d need for this project? Andrew had to do quite a bit of hunting around, but eventually managed to snag around 400 in under an hour. How? He not only targeted the right part of town, but chose a night for paper recycling and he got what he needed. Note that he had to stack up about 60 to get the right height for dining. For a bar, you’d need even more. 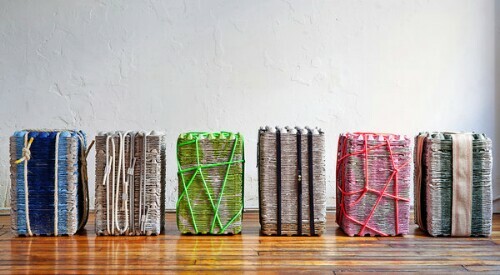 I can’t imagine how cool these would look as part of an apartment with contemporary décor. 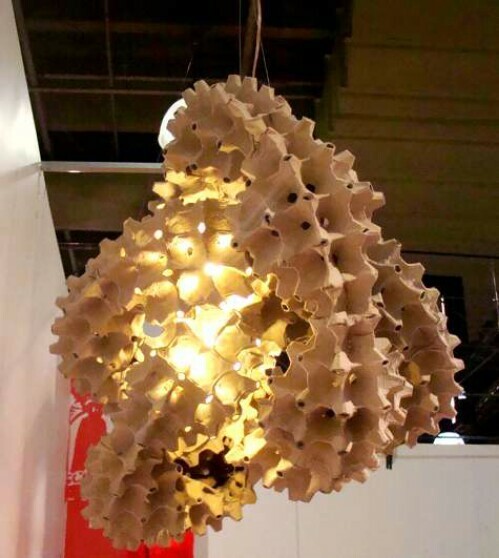 I want to share a few really cool lamp designs I have found with you which are made out of egg cartons, but I will start with the simplest of the lot. This project doesn’t require you to do anything fancy with the egg cartons; you use them as they are. It’s a great starter project if you are intimidated by the prospect of wiring up a lamp. Plus, it’s a YouTube video, so following the tutorial couldn’t be easier! Once you try this project out, you will be ready to press onto something even more ambitious. If you feel ready to take things to the next level and tackle a more challenging egg carton lamp with a similar cylindrical design, you can take on this flower lamp project! The result is absolutely stunning, and the tutorial is very detailed. There is a helpful grid and everything to assist you with placing the lights along with a number of tips. 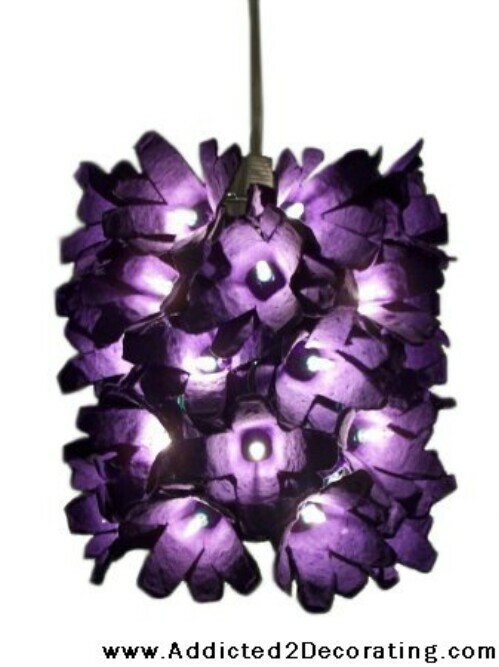 With complex projects such as the flower lamp, I find it very helpful to have more than one tutorial to follow, which is why I am also sharing this one. It’s a bit more succinct than the previous tutorial, which you may find helpful (or not). What I really like about it is that you not only get a different angle on the instructions, but this lamp looks very different from the other one. 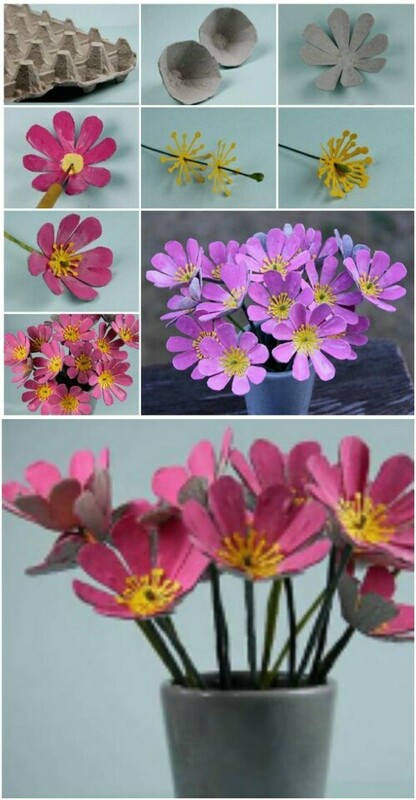 They are both cylindrical and both include flowers made out of egg cartons, but these flowers have a different cut and were painted another color. This gives you a feel for how versatile this project is and how you can use your imagination to take it in your own unique direction. You have so many flower ideas you could work with now! The lamp was featured at a design exhibition where students were asked to confine their material costs to around $1. The curves of the structure and the color of the egg cartons somehow puts me in mind of some kind of organic structure like coral or bone. It is very cool in any case, and it seems like there are a lot of different ways you could customize it. You can find the tutorial here. Scroll to the bottom and you will see how to lay out the strips before you interlock them into the cuboctahedron. The finished result looks quite complex, but the project actually looks relatively simple and approachable. I’m guessing an extra pair of hands might go a long way, so you might consider doing this project with a partner. I have gotten away from flowers for a while, but I want to share these designs with you! There are no step-by-step instructions for creating them, but the crafter who came up with them did post close-up photos of each. Looking at them carefully, you can start to get an idea for how she made at least a few of them. Others though I wish she would post a tutorial for! I just can’t resist one more wreath! This one is quite a bit different from the others in that it does not feature egg carton flowers at all. Instead, the egg carton pieces have been cut and shaped into leaves. These are joined one to the next to form the structure for the wreath itself. The wreath’s creator then inserted green twine and artificial flowers for a vibrant spring look. 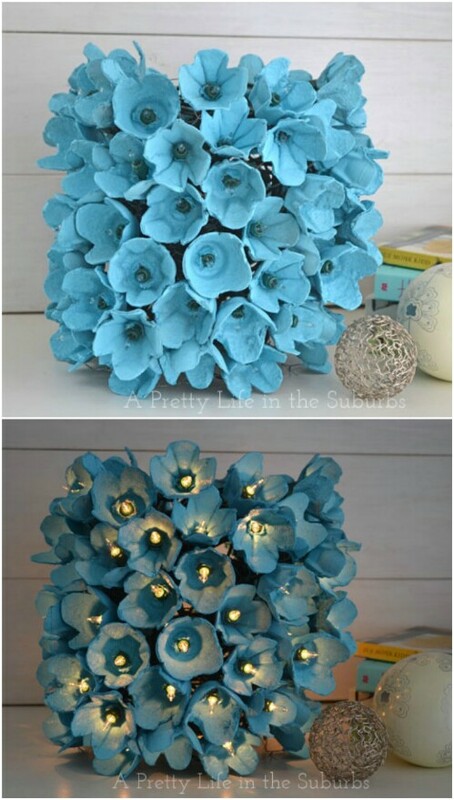 You could also use real flowers if you wanted to, but I would use artificial ones so that they will last! This project has been shared all over the web, and I searched high and low to bring you the source link. At first glance, you may think this is another wreath, but it is actually a centerpiece you can use for an Easter dinner. I imagine it would also look really awesome at a DIY wedding! You only need a few simple materials and a lot of patience. I am not a fan of chopping down trees for Christmas. It’s a waste of a beautiful living thing. We need to be growing permanent forests, not forests to last a season. If you’re looking for fun eco-friendly ideas to replace your old-fashioned Christmas tree, you’ll find a lot of good ones at the source below, including one made out of old egg cartons! A crown made out of an egg carton may not sound all that amazing, but check out the photo. It actually looks pretty amazing thanks to some silver acrylic paint and faux gems and glitter. 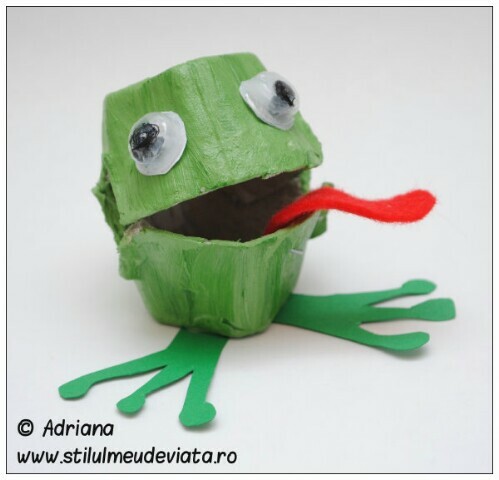 This would be a fun project for your kids to make on their own or with your help. It’d be really easy to customize, and the results will make any child feel like a little prince or princess! 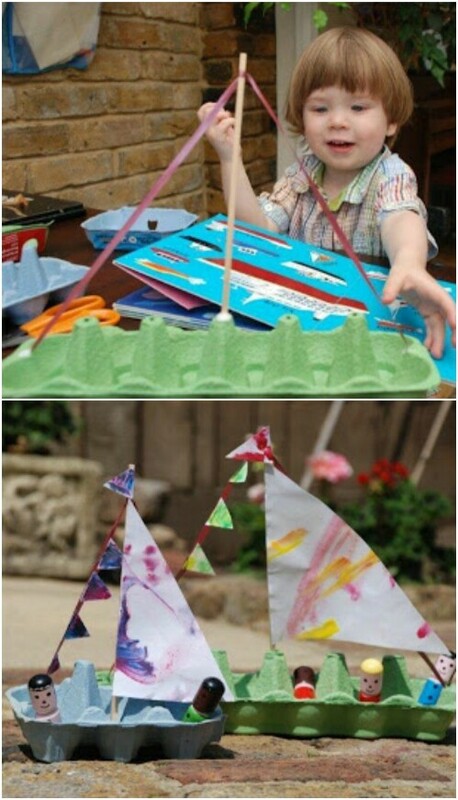 Here is another great egg carton project to make with your children which is perfect even for very young kids. Making these boats is easy. You just paint the cartons and create the mast and the sails. I imagine that getting the mast to stand upright is probably the hardest step. What is great about these boats is that they have little “seats” where the eggs used to go, so children can play with them with small figurines and such. 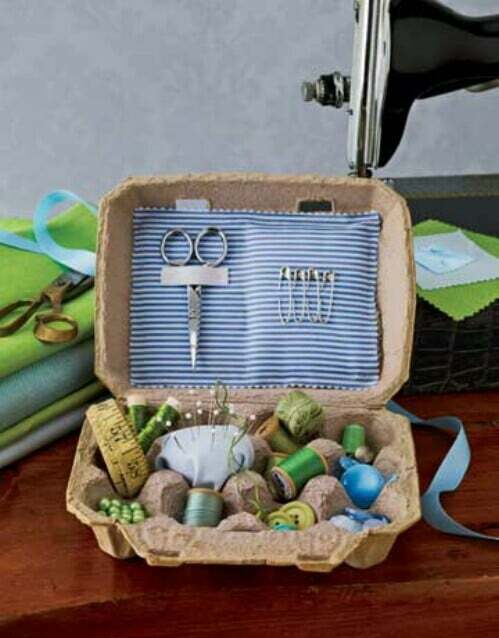 The little compartments in egg cartons are ideal for holding craft supplies, which makes it easy to up-cycle an egg carton into a sewing kit! This kit looks awesome just as it is, but you could easily paint and embellish it to make it extra pretty. 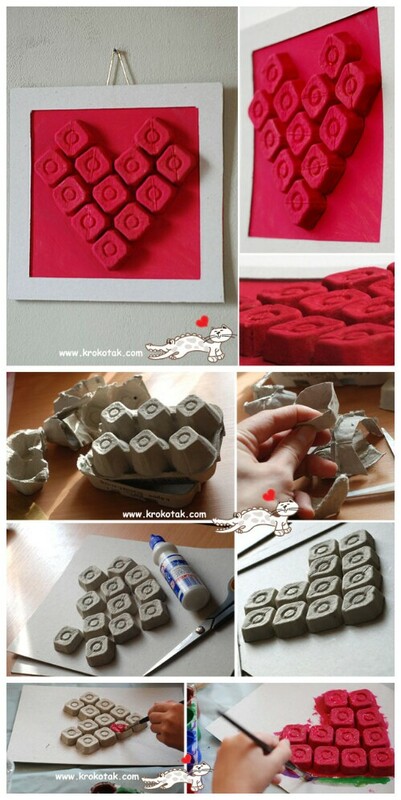 In case you’re curious, there are also cool crafts you can do with egg cartons that are made out of Styrofoam. One of the coolest is definitely this flyable glider. 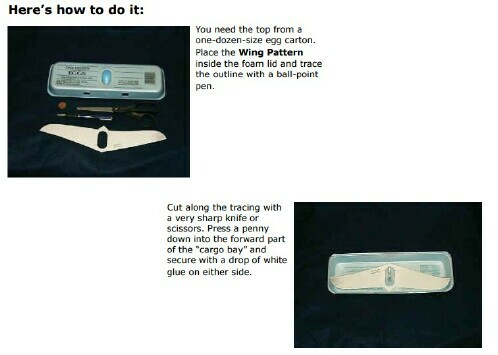 The tutorial will teach you how to easily cut out the correct wing shape. The natural curves of the box create the curves you need in the wingtips. Do this project with a young aviator or do it for fun yourself! That is probably a bit more than you want to tackle, but it does go to show that if you are dedicated, you can construct pretty much anything out of egg cartons. They are like life-size Lego bricks! You will notice that while this lamp is clearly made out of egg cartons, they have been entirely reformed. 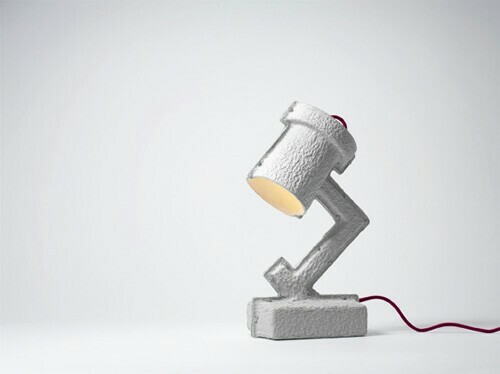 The way that this was done was by breaking the cartons down into pulp first, and then molding that into the finished shape of the lamp. 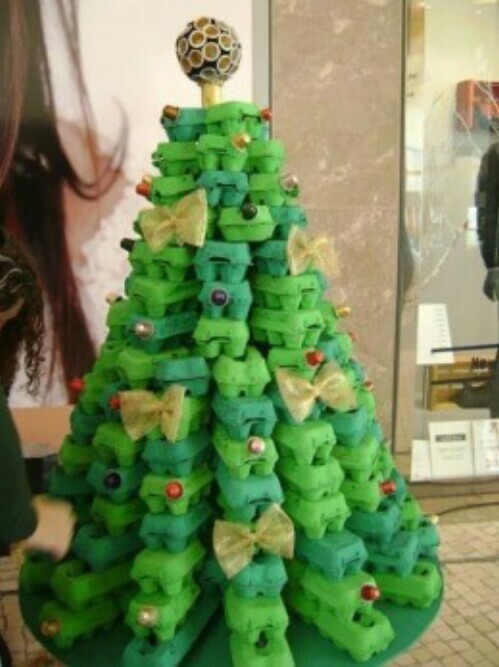 This is a wonderful example of how you can create practically anything, even a functional item, from egg cartons. The key of course is to know how to turn the egg cartons into pulp which you can then mold. You will find an excellent tutorial here. It is so easy—you just need the cartons, warm water, glue and salt. You can then turn the pulp into whatever you want; the sky is the limit! 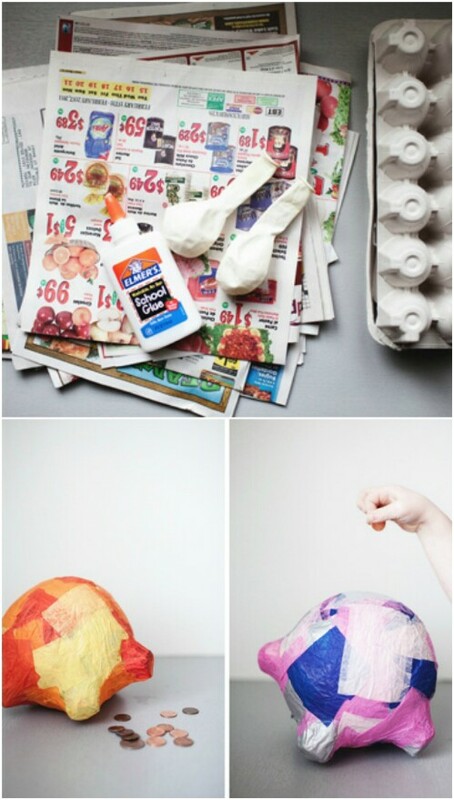 Now you should be fairly bursting with ideas for your own egg carton projects. Have fun creating light fixtures, wreaths, centerpieces, children’s projects and more! Sorry to say, but this is just more worthless bait and switch. Bait us with promises of how-to, switch to 80% ads and junk and zero useful hints. NOTHING to talk about how to actually get these plants to GROW. Only a few pretty pictures of what other people have done, each one with its very own irritating junk ad (or ads). Very very disappointed in this. As in most of what you post. I hope you’re making good money hosting all this garbage. Plants? What plants? 🙂 Each and every project listed has an attached link to project creator’s site. That’s funny. I saw that exact X-mas tree live, in a mall right by my house in little Portugal. It was made by school kids in an exhibit in 2013 or 2014, I believe.